Jason Dufner holed out from the fairway for eagle, rolled in a putt across the green for par and kept making birdies until he stood 12 feet away from a shot at the lowest score in the 153 years of championship golf. One last birdie attempt didn’t even get to the hole, and Dufner had to settle for a record-tying round of 7-under 63. 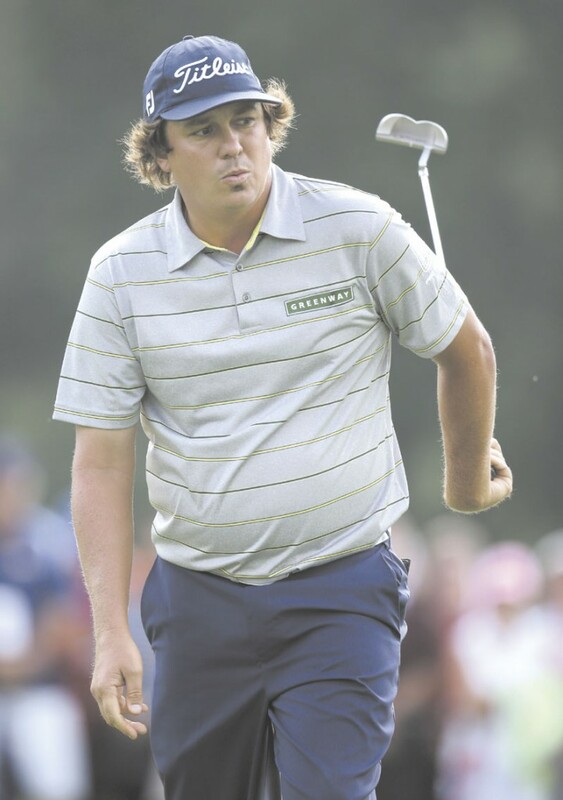 PITTSFORD, N.Y. (AP) — Nothing was dull about the way Jason Dufner played golf Friday at the PGA Championship. If anything, it was historic. Dufner holed out from the fairway for eagle, rolled in a putt across the green for par and kept making birdies until he stood 12 feet away from a shot at the lowest score in the 153 years of championship golf. One last birdie attempt didn’t even get to the hole, and Dufner had to settle for a record-tying round of 7-under 63. It was the third time in the last seven years at the PGA Championship that a player had a putt at becoming the first player to shoot 62 in a major. Tiger Woods circled the hole at Southern Hills in 2007. Steve Stricker narrowly missed at Atlanta Athletic Club two years ago. Dufner didn’t feel disappointed for long. On a rain-softened Oak Hill, where pelt-sized divots were flying and birdies were falling, Dufner surged to a two-shot lead over Masters champion Adam Scott, Jim Furyk and Matt Kuchar. At 9-under 131, Dufner tied the 36-hole record at the PGA Championship he now shares with six other players. Dufner was alone at the top, and in the company of some big names in history. His 63 broke the course record at Oak Hill held by Ben Hogan, Curtis Strange and Webb Simpson, who shot 64 about five hours earlier. Dufner became the 24th player to shoot 63 in a major — Greg Norman and Vijay Singh, both in the Hall of Fame, did it twice. And through it all, he barely cracked a smile. The possibilities were endless on a day that began with three hours of a steady rain until the sun broke through and took all the bite out of Oak Hill. Simpson also had a chance at 63 until he made a bogey on the 16th hole of his round. U.S. Open champion Justin Rose shot 29 on the front nine to get back into contention. When the second round finally ended, 27 players remained under par — this on a course that is stubborn when it comes to par. In five previous majors at Oak Hill, only nine players have finished the tournament in red numbers. Jack Nicklaus did it twice. The cut was at 143, the lowest at the PGA Championship since 2001 at Atlanta Athletic Club. For all the low scores, Tiger Woods and Phil Mickelson were left behind. Woods couldn’t get anything going, exchanging birdies with bogeys during a poor putting round that led to an even-par 70. He was at 1-over 141 and 10 shots back going into the weekend. Woods went to the range with his swing coach, trying to find answers. He has only one score in the 60s in 14 rounds at the majors this year. Mickelson’s swing apparently went missing in the three weeks since he won the British Open. He was all over Oak Hill and still managed a 34 on the back nine until his wild shots caught up with him. Another 71 left him 11 shots out of the lead. And here he is, in record fashion. Dufner’s popularity has grown the last two years because of his zombie state. He was responsible for the craze known as “Dufnering” in April when someone took a photo of him slumped against a classroom wall, eyes in a daze, during a charity event at an elementary school as the teacher taught children how to relax and concentrate. But there were nerves, no doubt, and Dufner showed them at the very end. A 6-foot birdie putt on the 16th hole put him at 7 under for the round, and his 15-foot birdie putt on the next hole grazed the cup. He followed with two flawless swings on the tough 18th hole, which had yielded only four birdies at that point. That left him about 12 feet below the hole. And he left it short by about 18 inches. There even was a nervous moment on the tap-in, when the ball came off the putter weakly and dove in the right corner of the cup. That part is still to come. Low scores were available to anyone. Even after Dufner finished his round, K.J. Choi had an 18-foot birdie putt on the 16th hole to reach 7 under. It narrowly missed, and Choi made bogey on the next hole to end that threat. Scott is swinging the club beautifully, and his only flaw Friday was not holing enough birdie chances when the rain stopped. Even so, he was in the hunt on the weekend for the fourth time in the last six majors. He will be in the final group with Dufner on Saturday. Henrik Stenson, a runner-up at Muirfield, had a 66 and joined Rose at 6-under 134, only three shots behind. Stricker and Robert Garrigus were another shot behind. Dufner is a student of golf history and was thrilled to part of it. But while that 63 put him in the record book, it doesn’t guarantee the trophy. Of the 25 previous times that someone shot 63 in a major, only five players went on to win — Nicklaus and Johnny Miller in the U.S. Open, Norman in the British Open and Woods in the PGA Championship. Now that’s some elite company.